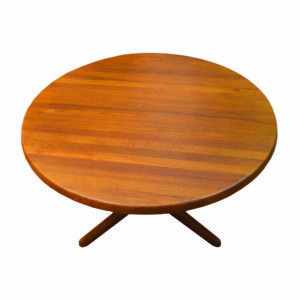 Beautiful round coffee table made in Denmark in the 1970s. 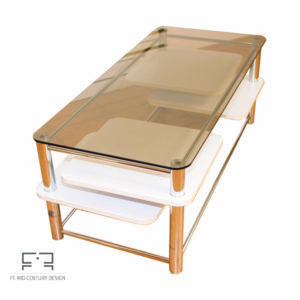 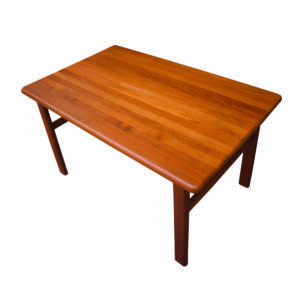 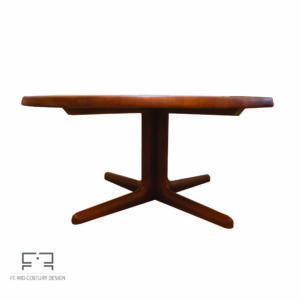 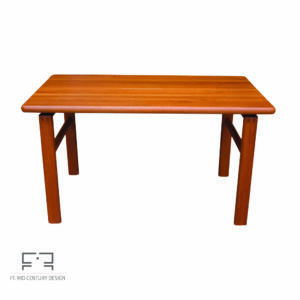 The table is made of solid teak and has a very stylish minimalist look. 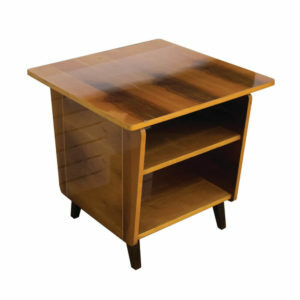 The item is in very good vintage condition and could be an elegant and work addition to any interior. 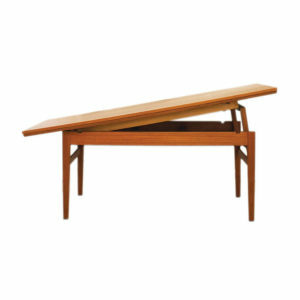 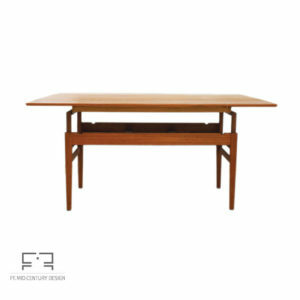 Large draw leaf Vejle dining table stands firm in its solid pine core covered with a teak veneer. 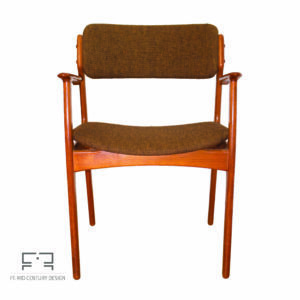 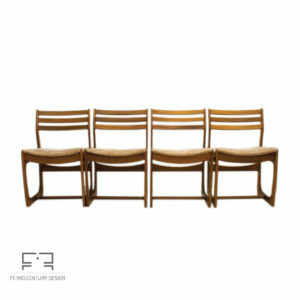 Designed by Henning Kjaernulf for Vejle Stole og Møbelfabrik, this hefty beauty boasts solid teak legs and gorgeous edge banding. 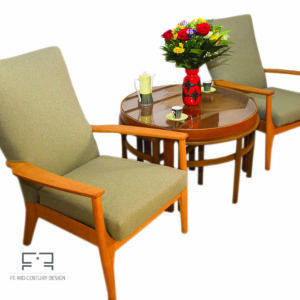 The contrasting wood grain on the leaves enhances the simple and minimalist nature of this true Scandinavian design. 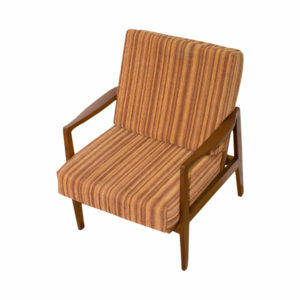 The item is in good vintage condition, with only some minor traces fo use/defects (please see photo). 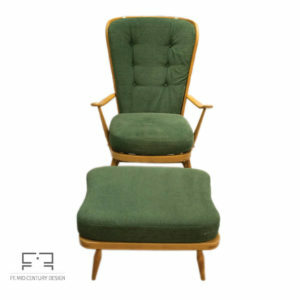 Comfortable and elegant Kroken leather armchair with matching foldable footstool designed by Ake Fribytter for Nelo Möbel and manufactured in Sweden in the 1970s. 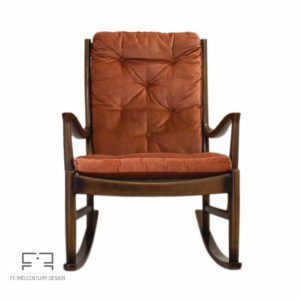 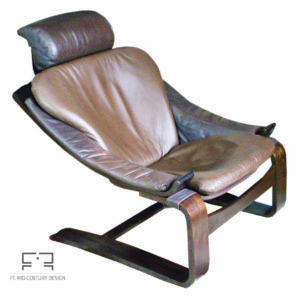 Both the armchair and the footstool are made of wood with soft, rust-brown leather. 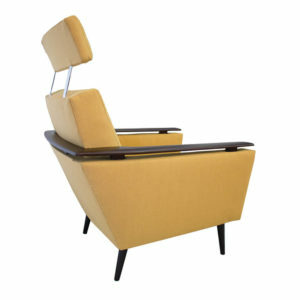 The armchair features an adjustable and removable headboard. 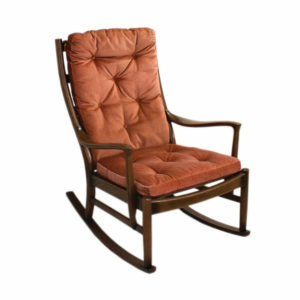 The item is in good vintage condition with minor defects consistent with its age. 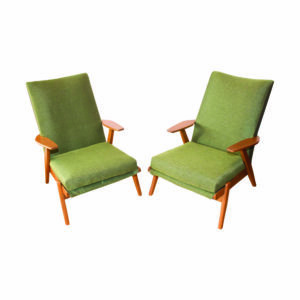 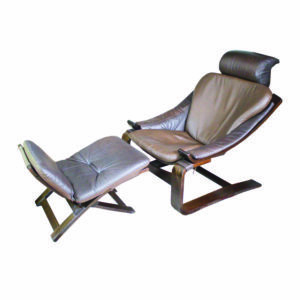 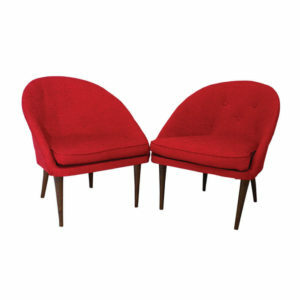 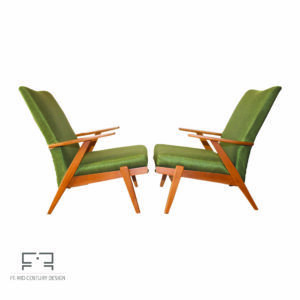 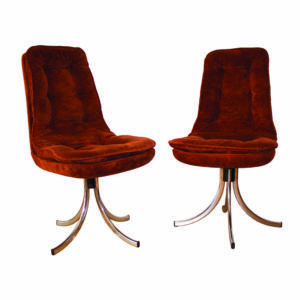 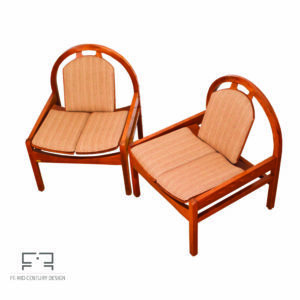 Beautiful Mid-Century pair of lounge chairs designed by Georges Tigien and manufactured in France, in the 1960s. 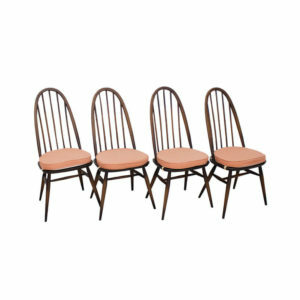 The plastic laces are made by the French manufacturer Prenas and the use of them (called scoubidou) is typical for Tigien. 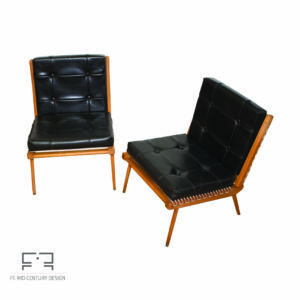 The upholstery is made of faux leather. 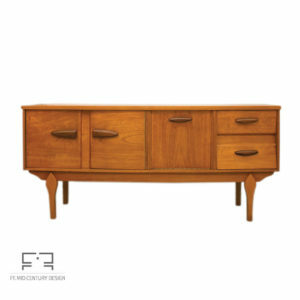 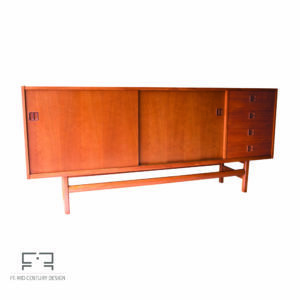 The wooden frame is made of teak, a typical essence for Mid-Century high quality furniture. 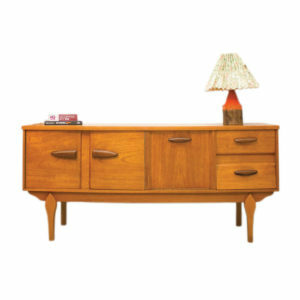 The items are in good vintage condition. 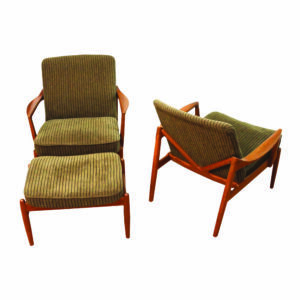 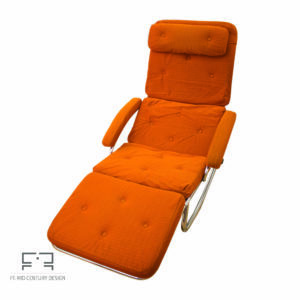 Comfortable Mid-Century armchair made in Germany in the 1970s. 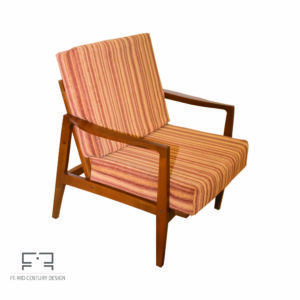 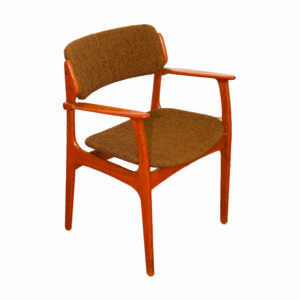 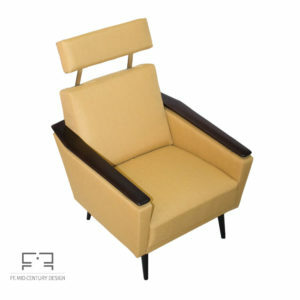 This armchair has a wooden frame and features removable seat and backrest cushions. 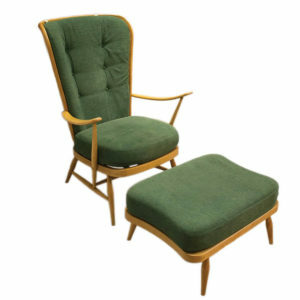 Recently restored, the item has new upholstery in earthly colours. 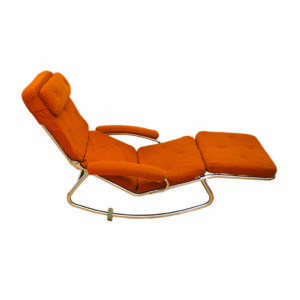 Displaying the iconic lines of the German minimalist and rigorous design, this item is in good vintage condition. 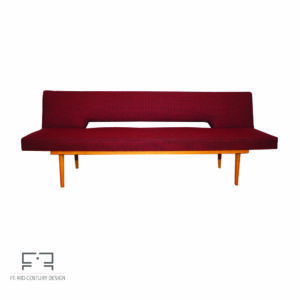 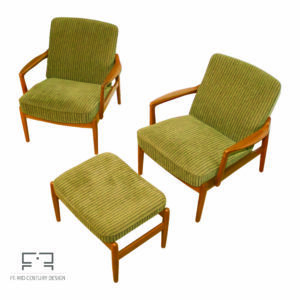 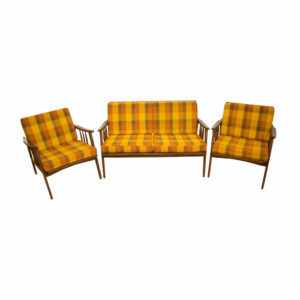 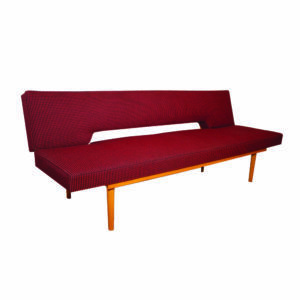 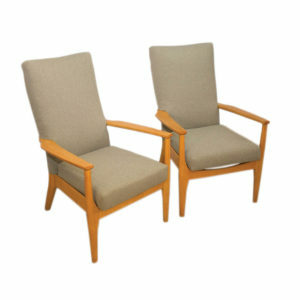 Beautiful Scandinavian style Mid-Century set consisting of a two-sear sofa and the armchairs. 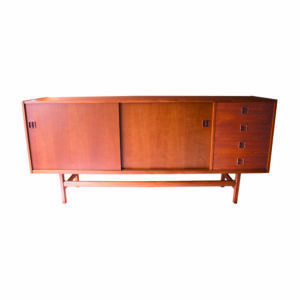 The set is manufactured in the 1960s in France. 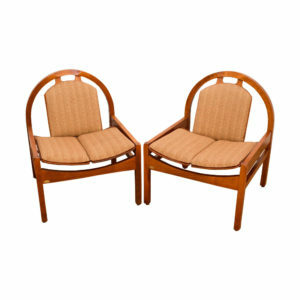 This set is very comfortable and shows the lines of the minimalistic and rigorous design of that time. 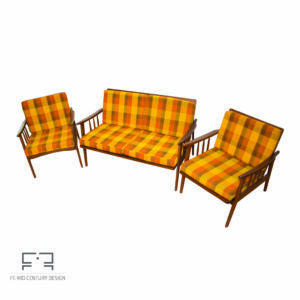 Yet the very optimistic and cheerful upholstery balance the severe look and gives this set an overall contemporary aspect. 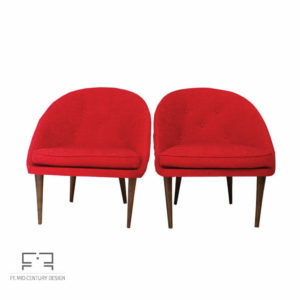 One of the cushions have a little defect on the back (see the last photo). 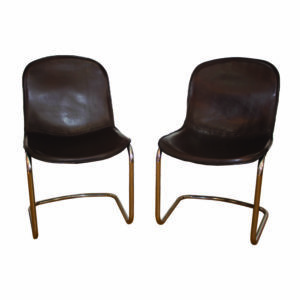 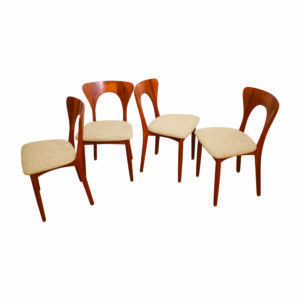 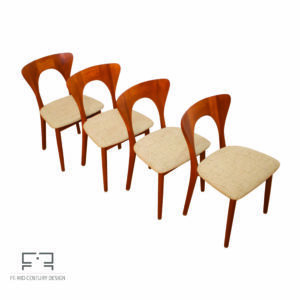 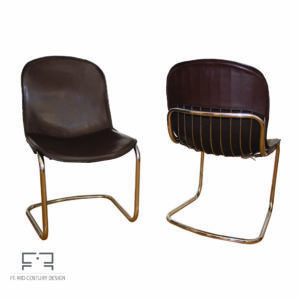 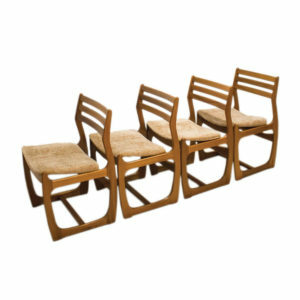 The exquisite Argos chairs are manufactured by Baumann in France, in the early 1980s or late 1970s. 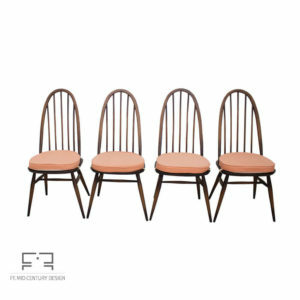 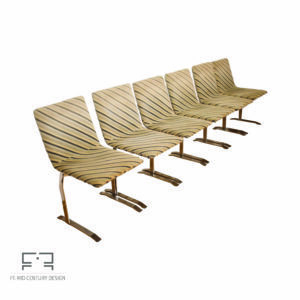 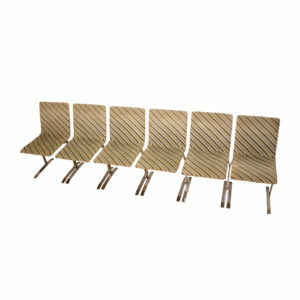 Made of beech and plywood, this chairs have very comfortable upholstered seats and backrests. 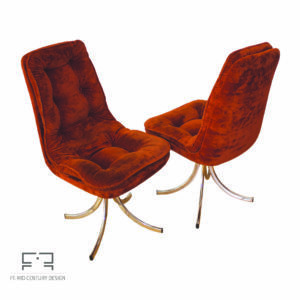 With a modern and fresh look, they features both the futuristic lines of Space Age design and the classical ones of the French Art Deco. 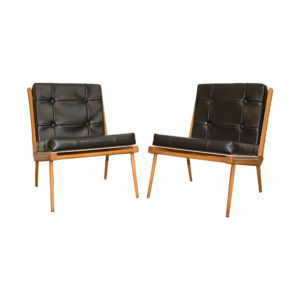 Marked by maker, this items are in very good vintage condition and could be a nice addition to any contemporary interior. 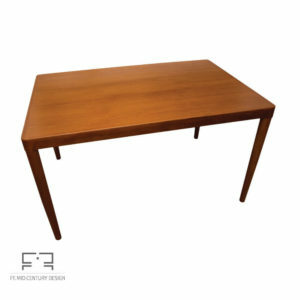 Elegant desk made in Germany (RFG) in the early 1970s. 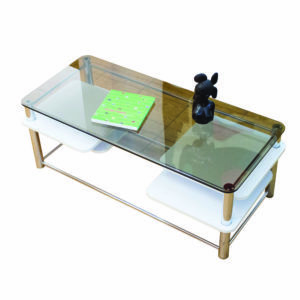 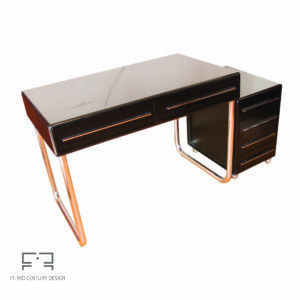 The desk is made of polyurethane, a material that was very high-tech. 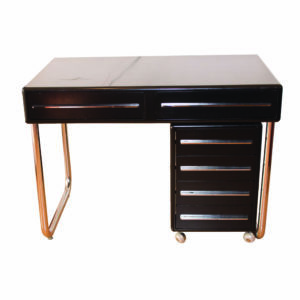 It features chromed legs and drawer handles. 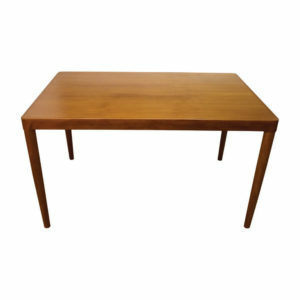 The item has some minor signs of ware, consistent with its age (visible in the photos) but it is in an overall good vintage condition. 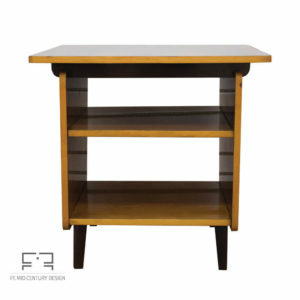 It also has its original label and could be a nice and modern addition to your study room or office.